basic human needs such as; food, shelter and clothing. it is only part of the work we do at Ozanam Inn. independent living and a renewed feeling of HOPE. race, gender, creed or social or political preferences. Find out more in the "Services" tab of this webite. and in need to help them realize their potential. At Ozanam Inn, we give a fish to eat today and teach to fish for tomorrow! 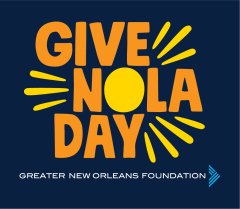 Please join us on Tuesday, May 7th for GiveNOLA Day! Ozanam Inn and GiveNOLA Day.